The “Encourage sufficiency” sustainable business model archetype for example is about solutions that actively seek to reduce consumption and production. The focus is on customer relations and influencing consumption behaviour, product design for durability, a fundamental shift in promotion and sales (e.g. no overselling) and supplier selection based on durability. Profitability would typically result from premium pricing, customer loyalty, and gaining market share from better (e.g. longer lasting) products. Societal and environmental benefits of sufficiency-based business models include reuse of products and resources across generations, reductions in product use, and societal education (Bocken et al., in press). In the clothing industry, the Common Threads Initiative by Patagonia is a good example of ‘sufficiency’. The company pledges to ‘build useful things that last, to repair what breaks and recycle what comes to the end of its useful life’, whereas customers in return are asked to pledge to only but what is needed and will last, make repairs and reuse (share) what is no longer needed and recycle anything else. Patagonia also asks customers to “Not Buy” their jackets, trying to make them aware of the effects of their purchases and encourage them to make things last rather than buying new. However this may have the same effect as asking people not to think of a pink elephant… yes, more purchases! Clothing swaps, where you come together with friends and swap clothes you no longer wear, are a fun way to freshen up your wardrobe without having to buy something new. It makes use of the ‘resources’ we have in the back of our wardrobes. This also encourages reuse of resources rather than new sales. A specific initiative by M&S encourages its customers to ‘shwop’: to donate clothes to charity through collection bins placed in their stores. In return, customers receive discount vouchers for M&S. Although shwopping encourages customers to have a critical look at their wardrobes and give unwanted items to charity, it does not encourage fewer sales, it may even encourage more by generating traffic to the store. In the furniture industry, Vitsoe is an interesting example of ‘sufficiency’. Vitsoe has created a video, which shares vision against planned obsolescence – ‘the design and manufacture of products that are deliberately intended to have a limited useful life’ –, which results in an endless cycle of replacement and repurchasing. Vitsoe’s design is aimed to be timeless and durable and its 606 shelving system is still compatible with its first system decades ago. Vitsoe does not give discounts and employees do not receive sales commissions. Vitsoe seeks to provide customers with furniture solutions that ‘do more with less’. How can a business still make money if it sells less? Neither Vitsoe nor Patagonia is on the lower end of the price spectrum – on the contrary. Their products are premium-priced but they believe in good customer service. Vitsoe for example helps customers reinstall its shelves when they move home. Patagonia supports repair of its products. The proverb “I am not rich enough to buy cheap things!” applies here. Although the number of sufficiency-based business models is not yet overwhelming, the concept of making products that last and are repairable is not new and there is an opportunity to make it stylish again to make stuff last. In the fashion industry there are several emerging business models such as Mud Jeans who have combined a sufficiency-based idea with leasing, or the ‘deliver functionality, not ownership’ archetype discussed in the next blog. What interesting sustainable business model innovation-combination will be next? 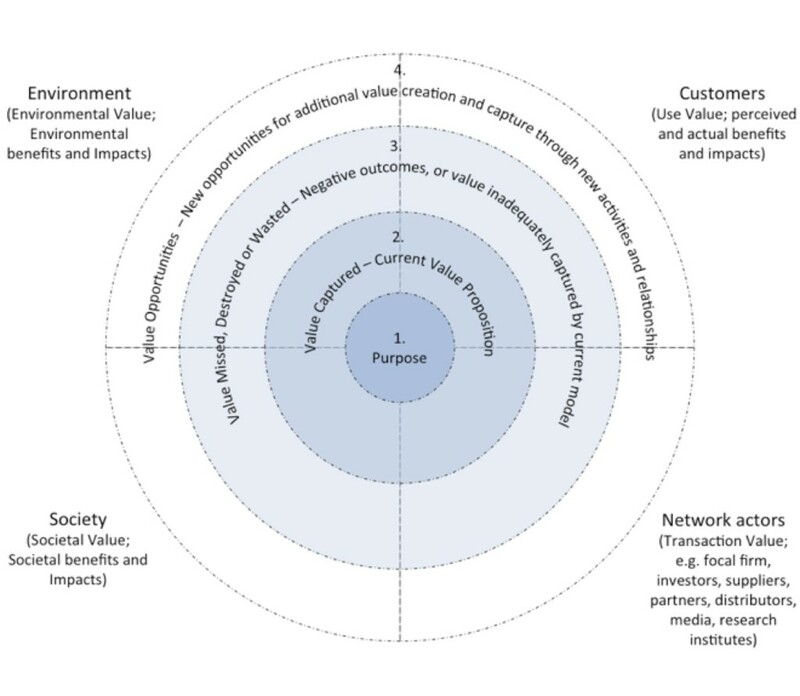 Sustainable business models include a triple bottom line approach and consider a wide range of stakeholder interests – including environment and society – into the way business is done. They are important in driving corporate innovation for sustainability, can help embed sustainability into business purpose and processes, and serve as a key driver of competitive advantage. Many innovative concepts and approaches may contribute to delivering sustainability through business models, such as dematerialisation and choice editing, but these have not been collated under the theme of business model innovation. Through literature and business practice review, a wide range of examples, mechanisms and solutions that contribute to business model innovation for sustainability were identified. These were collated and analysed to develop a categorisation of sustainable business model archetypes. Sustainable business model archetypes are groupings of mechanisms and solutions that contribute to building up the business model for sustainability. The aim is to develop a common language that can be used to accelerate the development of sustainable business models in research and practice. Each of these archetypes will be discussed in greater detail in subsequent blog posts. In Europe, 43% of laundry washes are done at 40°C and 17% at 60°C or above, the average laundry washing temperature being 41°C. Reducing the wash temperature from 40°C to cold can reduce energy use by 50-65%. It seems that laundry detergent product innovations, campaigns to wash at lower temperatures, updated washing labels in clothing and the availability of more efficient washing machines have led to an increase in the number of cold washes in Europe. Washing at or below 30°C is on the rise: 32% of loads were washed at 30°C or colder in 2011 (up from 29% in 2008) (laundry data are retrieved from A.I.S.E., 2013). The development of concentrated cold-water laundry detergent can be seen as a win-win-win business model innovation, because it provides opportunities and benefits for manufacturers (of laundry detergent and new more efficient washing machines), retailers, consumers and the environment. Retailer-win: Less shelf space, because of concentrated products, more space for other products. Examples of companies who have created or promoted concentrated cold-water laundry detergent include P&G (e.g. Tide, Ariel), Unilever (Small & Mighty) and Marks & Spencer. Consumers in the UK spend about £780 per head per year on textiles and clothing, which amounts to 2.15 million tonnes in total or 35kg per person, of which one-eight is sent for re-use through charities and the rest is discarded. This shows ample scope to keep clothes for longer and to make them available for reuse. Innovative clothing retailers have started to offer consumers the opportunity to return second hand clothing to a store for new product discount vouchers (e.g. M&S) or asked consumers to pledge to make their products last as long as possible, keep them for longer and buy second hand. Patagonia now sells second hand clothing in its stores as well as through Ebay through their Common Threads initiative. Shwopping: bringing old clothing items into an M&S store (even if not from M&S) each time you come to buy something new. Sharing business models are about using “ over-capacity” to a benefit. As the sharing platform Yerdle estimates, 80% of the things in our homes are used less than once a month, and self-storage has gone up 1,000% over the past 3 decades. The accumulation of unused stuff also happens outside the home: cars are typically used less than one hour a day and usually by just one person at a time (in the US). We seem to be accumulating a lot of stuff that is not being used. This makes the case for sharing rather than buying. Under-used cars (Buzz car) and seats in cars (BlaBla car), flats (AirBnB) and beds in flats (couchsurfing) are now made available to other potential users through business models which charge a ‘use fee’. In this way, excess capacity can be used more effectively. Robin Chase (Zipcar) refers to ‘car sharing’ business models and even ‘bed sharing’ business models to describe these new business models. Which sharing business model will be next? New business-win: In the case of BlaBla car and Buzz car (car sharing and peer car rental) everyone can be an entrepreneur. It can make driving more affordable, or, in the case of car sharing, can make driving a more fun and social experience. Incumbent business-win: Although existing businesses may suffer (e.g. the hotel industry from AirBnB) some who act quickly enough (e.g. Avis who bought Zipcar) can transition to new business model models in this way. Consumer-win: Convenience, cost, environmental impact, socialising benefits. Can marketing be used to ‘save the environment’? How can marketing ‘save the environment’? Social marketing is about marketing activities to benefit society. Consider marketing against smoking. The “4 Ps of marketing” or “marketing mix” (product, place, price, promotion) can be used to limit cigarette sales. You can place cigarettes behind the counter (place), price them ridiculously high, make awkward packaging (“smoking kills”) and forbid public marketing campaigns (promotion). We can also use marketing to encourage behaviour, which is good for the environment (such as using low energy light bulbs) and discourage other behaviours, which are bad for the environment (e.g. showering long). Changing behaviour is not easy. People might not be aware of the necessity, be able to act (e.g. because of financial constraints), or willing to act (e.g. because they may not care). How can we use marketing for such a range of people? Perhaps, the most successful marketing campaigns use all the elements (product, place, price, promotion) of the marketing mix simultaneously. Also, if people do not care about the environment necessarily, they may want to be convinced about other benefits of behaviour change. Consider the product life cycle of a T-Shirt: the product life cycle starts at sourcing the raw materials (e.g. cotton), which is made into yarn, which is subsequently made into fabric, sewn together, shipped, stored in shops, bought by a consumer, washed, dried and perhaps ironed, and hopefully reused many times before being sent to a charity or recycling bank. This is a very complex system of activities. Over the life cycle of a T-shirt washing and drying the T-Shirt many times constitutes the main environmental impact (carbon emissions) (see Allwood et al., 2006). A designer can decide to change the product so that it does not have to be washed too often. Think about using sweat-wicking materials, or: removing the armpits from garments and coating areas where most stains usually appear (presented by an eco-fashion designer a few years ago!). The other benefits of washing clothing less often, can also be emphasised on the clothing tag: your clothes may last longer (promotion). The financial benefits of washing at low temperatures and not tumble-drying (price) and not having to iron by leaving your clothing to dry on a hanger may convince others that this is a good thing to do. Retailers may want to place the most environmentally friendly products (e.g. made of good materials, using long-lasting design) at a prominent place in their shops. In short, using the marketing mix, convincing consumers of additional benefits of eco-friendly products or behaviour (e.g. not washing my clothing too often keeps them nicer for longer), and educating about issues through the brand (nice-looking products with a convincing story), may be useful strategies for companies to pursue to reduce their ‘product life cycle impact’.